Heat the oven to 200 ° F. Pour the olive oil into a baking dish. Cut the vanilla pod lengthwise, grate the inside and mix with the oil. 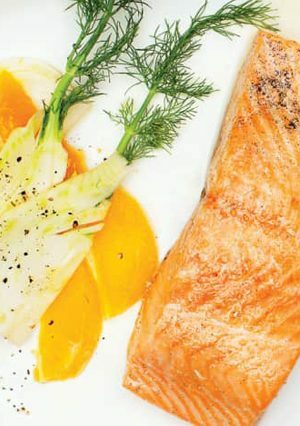 Salt the salmon pavé and immerse in the olive oil. The oil must cover the salmon. Bake for an hour. Meanwhile, prepare the salad by mixing all the ingredients. Remove the pavers from the oven and let them drain. Serve them warm, accompanied by the citrus salad.